Pretty quality made set of jewelry by Avon. 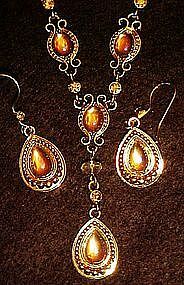 Antiqued gold tone metal with carnival glass color cab's. Chain has little clear crysal beads . Matching earrings have wires for pierced ears. Excellent like new condition.